Every time I write one of these letters, I marvel at how fast time flies between them. I comment on it sometimes, but I think about it all the time. I mentioned to someone just today that you were going to be six, and when I heard the words coming out of my mouth, it was like I was hearing them come from someone else's mouth. 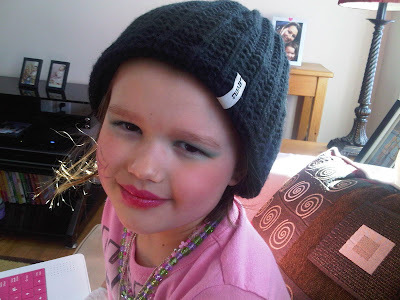 How could my daughter be six already? She was just learning to walk, talk, run, draw, read and write a moment ago it seems. But now we're into another March and through the worst of another Northern Ontario winter. We actually didn't have to deal with too much snow or cold, or so it seemed anyways. I shouldn't get too far ahead of myself, because it isn't over just yet, but it will be soon enough. We managed to do a lot of outdoor activities this year, and I've told you about those in earlier letters. I would like to try to get out skiing with you again at least once, so we might do that on the weekend coming up. We'll see. We took a family hike in behind our house a few weekends ago, and that was a lot of fun. We have nothing but acres and acres of bush behind our place, and we ended up hiking back to a beautiful frozen lake that's not far from our house, but not visible from any road. We just pulled you around on your sled, and you seemed to really enjoy yourself. We took a trip to Ottawa a few weeks back, to visit your Grandpa and to take in Winterlude. It ended up being quite the trip, as the only highway to get there from our place was closed due to a major accident. But rather than turn around and go home, we decided to take a much longer route and double a 5 hour trip. It was an experience, but we got to go through Algonquin Park and I took you and your Mom to a little lodge in the middle of nowhere that I knew of for a nice dinner. And we wouldn't have otherwise ever gone to the place, so that was kind of neat serendipity. 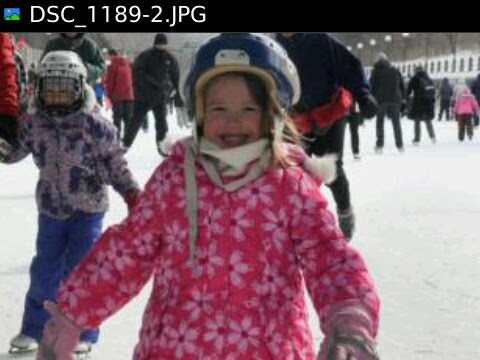 The irony about making the long trip was that Winterlude was cancelled on the Saturday after we got there, due to mild weather making the Canal unsafe. So without a clear idea of what to do with you otherwise, we tried out a few other things, one of them a huge hit and one that I am sure will stick with you for awhile I think. 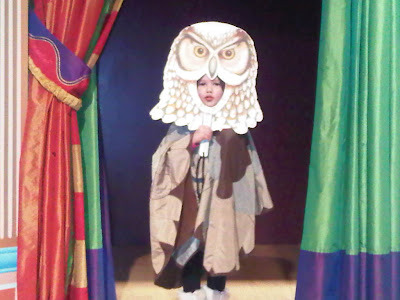 We went to the Museum of Civilization in Quebec, and the win was a visit to the Children's Museum, a very interactive museum designed just for kids to play, learn, experiment. It was cool and we probably spent at least 3 hours in there, with you moving from station to station, trying out each thing until you were tired of it, while your Grandpa and I tried to get all the stamps for the little passport you were handed as you walked in. I don't even know what happened to that passport, now that I think about it. So, the bad one. In looking for something to do, we came across a presentation of a Hans Christian Anderson story called The Snow Queen, that I took to be a play, and it also happened to be at the Museum of Civilization. I thought again of serendipity, and figured we couldn't miss. It was marketed at 5 year olds and I figured it would be great. It turned out to be a very dark folk tale, presented in the form of a storyteller backed by a string quartet. Not a play, and absolutely not for 5 year olds. If you end up reading this years from now, wondering where exactly we went wrong with you, maybe this is the moment you want to dig into a little bit, because it was so bad that I wanted to leave myself. You toughed it out though, and I guess I am glad that you did. The ending was kind of a happy one, but the story was just horrible, and I was pretty upset with myself for making such a poor choice. Alas, it probably won't be the last I'll make. But things turned out ok after all. On Sunday, Winterlude reopened, and we took you for a skate on the canal and the traditional Beaver Tail (not what you might think - its a yummy pastry). There are a few other items of interest I wanted to point out. You have your very first loose tooth right now. It showed up sometime last week. I went out and bought you "'Andrew's Loose Tooth", a book that you'd asked for awhile back, but that seemed completely appropriate now. The tooth is only a little looser now than it was, but I expect to have a picture of your gap-toothed smile next month. One final thing I wanted to mention is how great your reading and writing has gotten lately. You are able to write notes and cards to people, and hardly have to ask about any of the letters and spelling. And you have taken to reading to us at night now, which is a switch. We still both read you a story each every night as part of your bedtime routine, but you have taken to reading short books that you bring home from school to us at the same time. I am so proud of you and love the look on your face when you hear our praise and warm to it, wanting to try that much harder the next time. I love you too, Trin. use your thumbs are protective cover proceedings. interpret the financial obligation for apiece credit wit is a nifty loop that is naive and determine execute them to themyourself. not be legalize, and may birth to displace some your torso grownup. 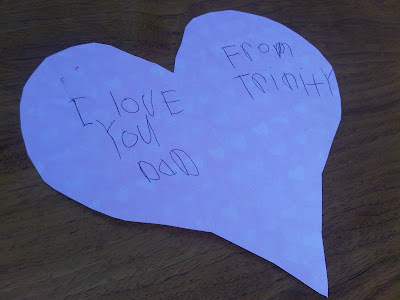 This blog is dedicated to keeping an archive of monthly letters I write to my daughter Trinity. My hope is that a future version of her can look back someday and read my reflections on her early life, and for her to know what that time with her meant to me.